This is a remarkably versatile salad you can make with just about anything in your refrigerator. Berries add a nice sweetness to the vegetables, and the mozzarella brings some salt. Mix it up however you like! Mix all ingredients for the dressing. Season with salt and pepper and set aside. Bring a large pot of salted water to a boil. Add asparagus to the pot and cook for 2-3 minutes. Move immediately to a bowl of ice water to stop the cooking and sit for another 3-5 minutes until cool. Drain and set aside. On a large platter, arrange greens in a thin layer. 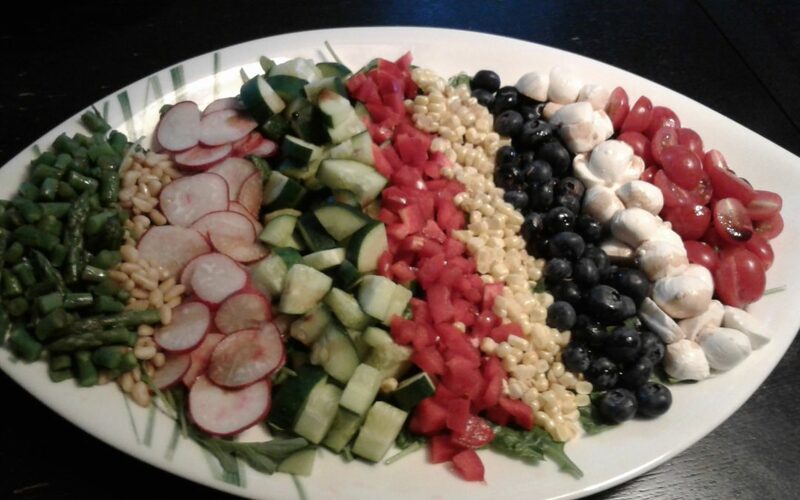 Arrange all remaining ingredients in lines over the greens as pictured, or if you would like just pile the veggies up!